The Resident Tourist: Goodbye Ticker Tape, Hello NYFW . . . I fully intended on going downtown for the Giants ticker tape parade yesterday, but after reading that there would be over a million people showing up for the celebration I figured it probably wasn't the best idea to take part in the mayhem alone. Unable to convince anybody to play hookie from work, I decided it'd be wiser to avoid the maddness. I did make it to Time Square though to check out some of the stragglers. It was quite the scene of jerseys, hats, hair cuts, and face paint. Take a look at some parade photos here. On another, and drastically different note, New York Fashion Week starts tomorrow. 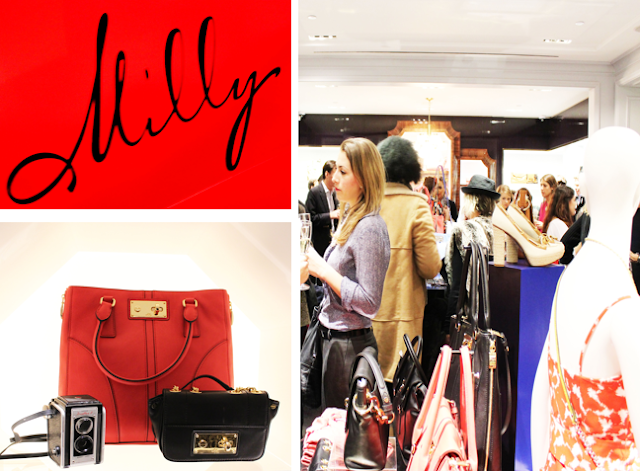 As a little preview I thought I'd share some pics from a pre-fashion week event I attended last week: Milly for Sperry Top-Sider launch party. Thrown at the Madison Ave Milly store, the launch was a lovely little cocktail party flowing with color, prints, and a collection of preppy fashionistas. The shoes were cute and great for the spring. Check out the styles here. Happy Fashion Week, New York!